The Lighthouse was built in 1872 and towers 117 ft. above sea level. It guided mariners for 61 years and was retired in 1933 when it was replaced by the South Jetty light. It is now privately owned and not open to visitors. A lighthouse, which may have been erected by the Republic of Texas, was dismantled during the Civil War and plans for the present Bolivar light made after that time. The Bolivar lighthouse is of brick sheathed in cast iron plates riveted together. It once glistened with a white-and-black banded exterior, but now is covered with rust and is almost a uniform black. The 52,000 candle-power beacon guided ships through the channel, which in earlier years was undredged, safely from the Gulf of Mexico into the Port of Galveston. Life at the lighthouse is very lonely and friendless. There is very little visiting because travel is non-existent from the point to Galveston. 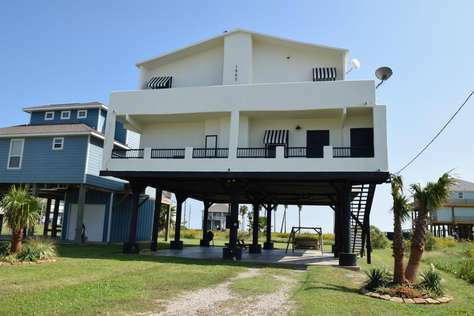 We pass most of our time by reading books.- The lighthouse withstood the onslaught of two of the worst storms recorded on the Texas Gulf Coast, the 1900 and the 1915 hurricanes. An inspector’s report said after the 1900 storm – which claimed an estimated 6000 lives on Galveston Island – that, -through the keeper’s efforts, the lives of 125 people were saved, and to my personal knowledge, he harbored and fed a large number of them for a considerable period. At one point during the storm, according to the story of one historian, the hurricane winds caused the tower to sway so badly that the machinery for the light failed to work, and that night Claiborne rotated the machinery by hand to keep the beacon bright. Winds of 126 miles per hour were recorded in the 1915 hurricane, and still the lighthouse withstood the pounding of wind and wave. The light in the tower burned every night during the years of it’s service except two nights of that storm, Aug 17 and 18, when the supply of oil used to light the lamps floated away after the surging waters of an 11-foot tide burst open the door at the base of the tower. Sixty-one people took refuge in the lighthouse during that storm, huddling on the iron steps during the night as winds rocked the tower, and peering out the windows during the daylight to see their homes and crops being destroyed. Two houses, on stilts for protection from rising tides, were built near the lighthouse for the lighthouse keeper and his two assistants. H C Claiborne retired and was replaced by Capt J B Brooks in 1918. The government sold the lighthouse as surplus property in 1947.The E W Boyt interests entered a private bid of $5,500, which was $500 higher, that the only other bid. On May 29,1933, after 61 years of service, the Bolivar lighthouse was officially retired. The inner mechanisms have been removed. The lamps and reflector lenses have been reassembled in the Galveston County Museum. In 1952, the land and buildings were sold to Pat E. Boyt. in 1968, the movie -My Sweet Charlie-. starring Patty Duke and Al Freeman, Jr., was filmed at the lighthouse. No longer painted and maintained, the lighthouse has rusted to a uniform shade of black. It stands, near Highway 87, a visual delight and a symbol of the romance and adventure of long-ago times at sea.